Share a ride by carpooling or vanpooling! You need just one or more passengers to create a carpool. To find someone to ride with, talk to coworkers, neighbors and friends. You might even ask the Human Resources office at your work site to help find someone that lives within your zip code. Looking for a carpool buddy? 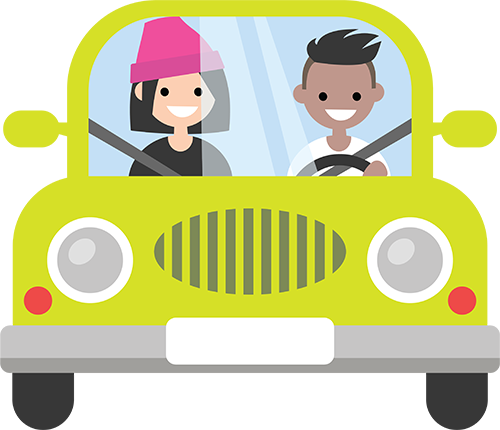 Check out myCommuteSolutions, which is a carpool matching and trip-planning tool for the Austin area. You can search for bike routes, discover transit routes and log your commute. The myCommuteSolutions site has an easy tracking system through the commute calendar, which enables users to follow their cost savings, calories burned, fuel saved and pollution reduction. To connect with potential carpool buddies, you can log on to myCommuteSolutions.com, and create a profile that will allow you to use the free carpool matching service. A key feature of myCommuteSolutions is the ability to set up custom sites for business and employees can search for carpool buddies within your organization. Have your employer contact Commute Solutions to create their own custom ride-matching sub-system and find a co-worker to carpool with! This is available to both individuals and businesses at no cost. The myCommuteSolutions site serves Bastrop, Burnet, Caldwell, Hays, Travis, and Williamson Counties. MetroRideShare provides eligible groups of 5 to 12 riders with a month-to-month vanpool lease agreement, including insurance, maintenance, 24-hour roadside assistance and an optional fuel purchasing program. The MetroRideShare program is sponsored by Capital Metro. MetroRideShare provides the services necessary for you to enjoy a comfortable, convenient and economical commute to work. To start or join a vanpool, register with MetroRideShare or call 512-477-7433 (RIDE) to get started. MetroRideShare will also help find your vanpool match. Waze Carpool is a program that allows people to share rides going the same way. You can choose to carpool with only coworkers or with new friends along your route. Metropia’s DUO feature streamlines and incentivizes social carpooling. DUO reduces the in-app pairing process to a single tap on the passenger’s smartphone, making it possible for commuters to instantly begin their trip without exchanging contact information or searching through profiles. DUO’s engaging variable rewards program employs gamification elements to encourage frequent, ongoing use. Read more about DUO here or download the app for iPhone or Android. The University of Texas encourages carpooling by offering reserved carpool spaces, reduced permit fees, Share Passes, and automatic enrollment in the Guaranteed Ride Home program. Austin Community College offers registered carpools with exclusive, convenient parking spaces on campus before 10 a.m.
Texas State University offers a number of transportation options and resources for students, faculty, staff and visitors. Arrange compensation. Take turns driving the carpool equally, or share fuel costs with those who live farther away. Have lengthy cell phone conversations while you’re in the car/vanpool. This website is not an endorsement of the listed companies, but a resource for residents and visitors.